This division specifically caters for the home based party, be it a kiddies birthday, 18th, 21st, 30th or 70th birthday party. We have an extensive range of jumping castles to cater for all ages; tiny to tall, we have it all.All our jumping castles are manufactured and maintained in-house. That is why you get well maintained, hygienically cleaned jumping castles every time. Our jumping castles are cleaned and assessed after every rental. 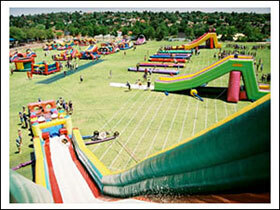 We rent out our jumping castles for the full weekend. Clients can collect the jumping castle from our offices on a Friday during the course of the day and return it to us on a Monday by 12h00.We also offer a delivery service at a cost relative to the distance from our offices. 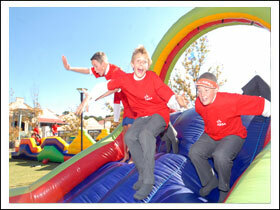 There is no better way for a school to raise funds while kids have fun. Kids just love to bounce about, and at a school fun day they get the opportunity to bounce about on a range of interactive inflatables, what fun!!!! We have experienced trained staff that assist in the controlling and ensure the safety of all the inflatables and kids while they are having fun. There are various packages to choose from, tailor made to suit the needs of each school. This is an absolute must for all schools! Company functions are a great “ice breaker” for colleagues which is fun focused.We know that one size does not fit all, thus we have an extensive range of interactive inflatables to cater for all ages attending your company function. 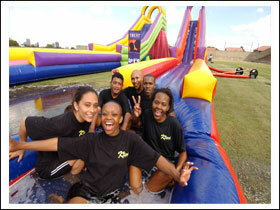 We tailor each company function to meet your budget. We unfortunately do not facilitate any team building events.